The Kendal and Windermere Railway, otherwise known as the Lakes Line, is a branch line from Oxenholme, on the West Coast Main Line Railway, via Kendal to near Windermere, opening fully in April 1847. Despite opposition from various people, including William Wordsworth, against what they saw as destruction of the Lake District landscape, the line went ahead, initially to Kendal, and finally to Windermere. The double track branch line became single track in 1973 to save money. With the West Coast Main Line electrified, consideration was given to electrifying the branch, but this was not carried out. 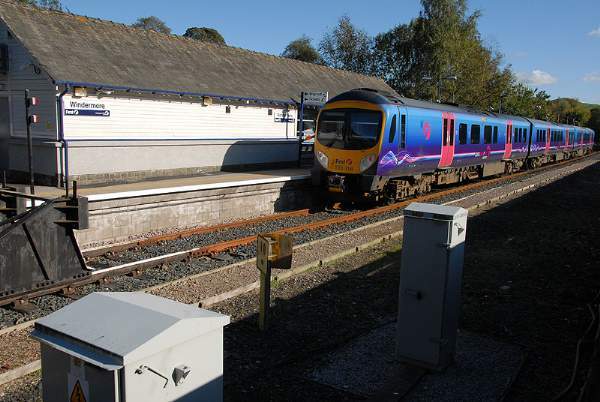 In 1994, the branch began what may be seen as a renaissance, with through trains introduced to Manchester Airport, which are now run by TransPennine Express. Oxenholme Station. Photo by Matthew Emmott.